LWS member publishes his first book! Henry Shaw leads a relatively quiet life trying to balance his work at a growing law firm with his family life, including supporting his teenage son who has a promising soccer career ahead of him. But all of that changes when Henry’s bipolar brother, in one of his manic states, tells him that Goliath didn’t really die as told in the biblical story – and that he is Goliath. 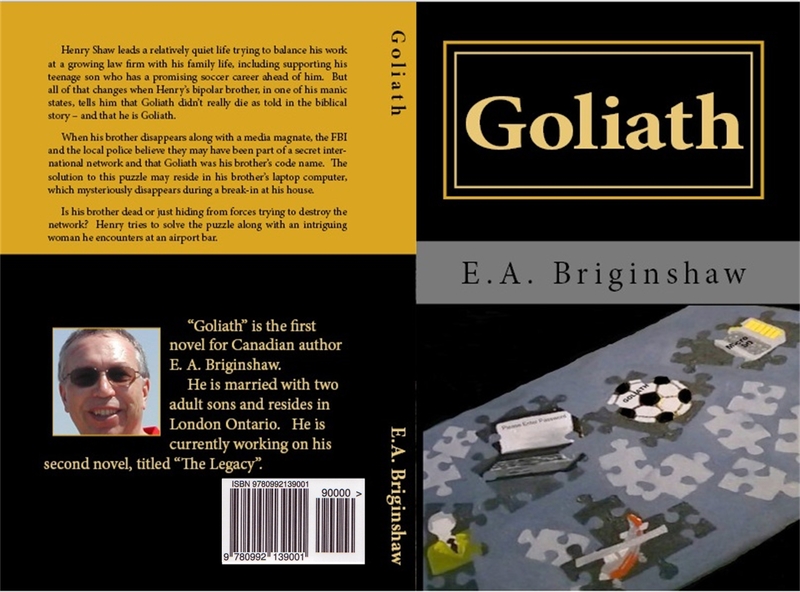 When his brother disappears along with a media magnate, the FBI and the local police believe they may have been part of a secret international network and that Goliath was his brother’s code name. The solution to this puzzle may reside in his brother’s laptop computer, which mysteriously disappears during a break-in at his house. Is his brother dead or just hiding from forces trying to destroy the network? Henry tries to solve the puzzle along with an intriguing woman he encounters at an airport bar. The print copy of the book is available at a list price of $9.50 USD, and the Kindle ebook version is available at a list price of $3.50 USD. The Kindle version is also available on Amazon.ca, but the printed copy of the book can only be ordered from the U.S. based Amazon.com or their European website. On the Amazon.com website, there is a “Look Inside” feature that allows you to see the first few pages of the book. 2 Responses to LWS member publishes his first book! Congratulations, Ernie! Your book sounds really intriguing! Can’t wait to read it!